Guangzhou Guanhao offers a variety of high quality custom made water bottling equipment including automatic water bottling machines and automatic water bottle filling machines. We also offer bottle filling machine known as the GH-2406, which can be found in the commercial products. Guangzhou Guanhao automatic water bottling equipment has been used in many bottling operations around the world and are best suited for areas with high manual labor rates. If labor rates are high and material resource cost much, bottling lines may be better. We will help you to design water bottling equipment that best suits your specific project. Guangzhou Guanhao automatic water bottling machines can be manufactured to produce any production level ranging from 1,000 to 80,000 bottles an hour. Multiple machines can be configured to work together to produce higher production levels. These automatic water bottling machines are multi-stage automatic pressure filling machines, which ensures uniform filling and appearance of bottles across the entire bottling line. Therefore all the bottles are filled to the exact same height and does not waste excess water. Foam overflow is forced out of the bottle through a vent tube or overflow port and back into a recirculation tube to ensure the bottle is filled to the proper level. The foam is then condensed into a usable state and recycled through the machine eliminating excess. Guangzhou Guanhao automatic water bottle filling machines use mechanical action. This means that the flow of water is started and stopped by a spring loaded valve that is opened by the force of making contact with the bottle to be filled. With these water bottling machines the filler head is lowered down onto the top of the container with a pneumatic powered sealing head. This sealing head has a soft rubber gasket which seals the neck of the bottle. The spring opens when it reaches the proper pressure, it opens the filling valve and the water flows into the bottle. With these automatic water bottling machines the overflow flows through the overflow port until the driving head raises and pressure is released from the spring stopping the flow. This prevents dripping as the head is removed and the next bottle is positioned for the next fill. With this type of automatic water bottling machine, the bottles then travel down the conveyor belt to the capping station to be capped without losing water from the bottles. From there the bottle is sent to the labeling station and labeled with the labels of your choice. The capping and labeling machines are different machines but are designed to work in unison with the automatic water bottle filling machine. 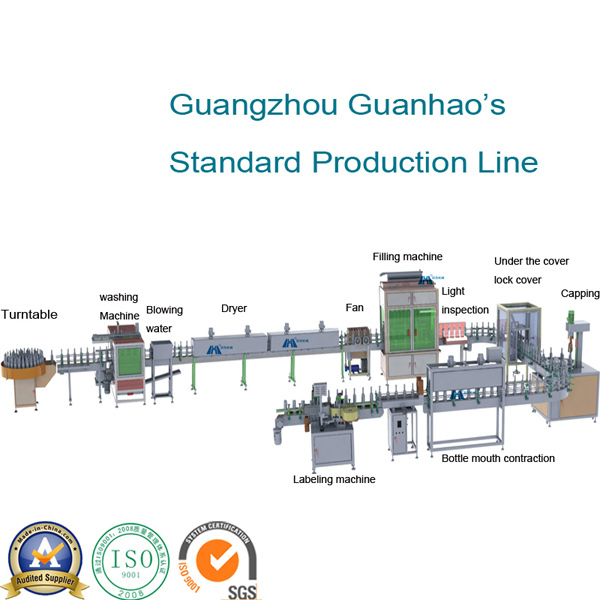 Guangzhou Guanhao water bottling machines are designed with high quality certified components to ensure reliability. The metal components within the machines are made with stainless steel to prevent any type of rusting and provide optimal machine life spans. The automatic water bottle filling machines and other water bottling equipment come with a 1 year warranty due to manufacturer defect.